Description: Location, location. 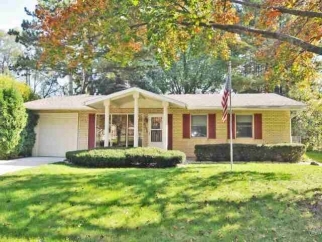 Fantastic ranch home located on a private, peaceful lot w/woods & fenced in yard! This home is a charmer w/beautiful family rm off the back overlooking park-like yard w/2 patio doors, lots of windows, gas fireplace & steps out to a patio! Includes 3 bedrooms, living rm, dining & kitchen w/wood floors. This home has been updated w/fresh paint, newer carpet, fireplace, electrical & has an attached garage. Walking distance to coffee shops, restaurants & grocery store. Rp $174,000-$179,000.